Feast day: September 23 The amazing miracles associated with Padre Pio are usually seen with the great saints of the Middle Ages: levitation, bilocation, heavenly visions, and the stigmata -- the bloody Five Wounds of Christ. But Pio of Pietrelcina is most definitely a 20th century saint. Born in 1887 as Francesco Forgione, he died in 1968 and was canonized by Pope John Paul II in 2002. Young Francesco grew up in a hardworking farming community. His happy childhood consisted of daily chores and the simple joys of a loving family. Perhaps as a sign of his future calling, Frencesco looked after his family’s flock of sheep at the age of 10. He knew as a child that God was calling him to the priesthood and he entered the Franciscan Capuchin novitiate at Morcone. At first vows, he took the name Pio to honor Pope St. Pius I. With God’s grace, he completed his studies and was ordained a priest in 1910 at the age of 23. Padre Pio became quite ill as a young man, suffering insomnia, fainting spells, stomach disorders, and terrible migraines. To help ease him back to good health, he was allowed to live outside the friary while still wearing the Capuchin habit. During this time when his body was failing him, inexplicable phenomena started occurring, including levitation while he was deep in prayer. As a priest, Padre Pio became known as a master in spiritual direction, and crowds of people would visit from miles away to go to confession and hear his wise counsel. He preached holiness and perfection of spirit. It was on September 20, 1918 that the wounds of Jesus’ crucifixion began to appear on his hands, feet and side while he was hearing confessions. These bleeding wounds were painful and would continue for the next fifty years until the end of his life. Padre Pio preferred to suffer silently but word got out about the stigmata and that drew even larger crowds of people who were eager to hear this holy man and be in his presence. Not surprisingly, Padre Pio’s stigmata was criticized as fakery, but his wounds were verified by independent medical examiners. The good friar was embarrassed by the attention caused by the stigmata and covered them up with mittens that only became red with blood. 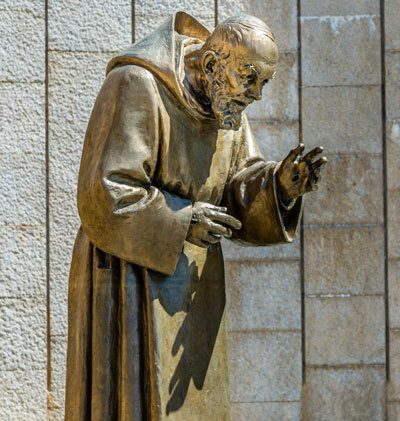 Padre Pio’s whole life was filled with suffering but that did not prevent him from carrying out his ministry of preaching and spiritual direction. In his hometown of San Giovanni Rotondo, he founded a hospital and medical research center, the Casa Sollievo della Sofferenza (Home for the Relief of the Suffering), whose adoption of modern technology and practices has made it one of the most efficient hospitals in Europe. The Casa serves an average of 57,000 inpatients a year. I learned about Padre Pio when I was a teenager, hearing stories about him from the priests at our Catholic high school. The stigmata always fascinated me. So when I visited Padre Pio’s hometown in Italy during a 2013 pilgrimage, I was overcome with emotion when our chaplain, Fr. Paul Wicker, was given the privilege of blessing each member of our group with one of Padre Pio’s “stigmata mittens.” I could only kneel down with tears in my eyes during the blessing because I had been touched by the holiness of a saint. This is a song about the redemptive suffering of Christ. In 2 Corinthians 12:7-10 St. Paul perfectly expressed the paradox of the Cross and applied it to his own suffering: “When I am powerless, then I am strong.” It is a scripture passage that reminds me of St. Padre Pio.